I’m quite frankly just as shocked (if not more so) as anyone else. 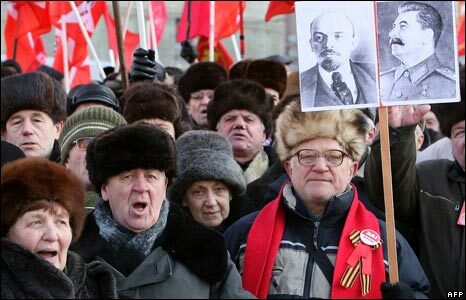 Protesting is a very un-Russian thing to do, which suggests that either there is some outside influence (possible, but not in the way you might think), or the Russian body politic has reached a hitherto unreached breaking point (in my view, only slightly more likely). The idea that the US or any other Western power is behind the protests is absurd. Western governments have an interest in the political stability in Russia, and would probably rather take their chances with a rearranged Putin-Medvedev duumvirate than gamble by supporting a popular uprising that might bring to the fore a more ardently nationalist leader. But I think there is some external influence emanating from the Arab Spring and the various other protest movements that have gained traction around the world this year. Once again, it would be absurd to suggest that the same sequence of events that played out in North Africa could be repeated in Russia. There are plenty of reasons why this is the case, but the most significant is rather practical: It’s not SPRING. The revolution in Egypt gained steam as the protestors camped out in Tahrir Square and became an immovable presence. I’ve been in Russia in December and I can assure you that no one will be camping outside. It will be very hard for infrequent demonstrations that disperse at night to gain much momentum. I am unequivocally in favour of it. I give the NHL kudos for deciding on a complete overhaul rather than just a minor adjustment to the current division format. For starters, the new format is a lot greener, as it will require fewer cross-continent trips. This has the added advantage of decreasing players’ fatigue from factors other than actually playing hockey! There have been some legitimate criticisms of the new four-conference format, but most can be easily dealt with. One argument is that, by giving playoff spots to the top 4 teams in each conference, weak teams in weak conferences will unfairly get in while good teams in stronger conferences will unfairly be left out of the playoffs. This is inevitable in any system, though, and is already present in the current one anyway. If last year’s teams had been divided up into the four new conferences, and playoff spots had been allocated using the new model, 15 of the same 16 teams would have made the playoffs. And the one team that would have been cheated out of a spot last year (the LA Kings) would actually be unfairly awarded a playoff spot this year if the season ended today. So the new model giveth and it taketh, but it doesn’t seem that it creates any inherently weak conference that would perpetually benefit from the imbalance. Another objection to the new format is that it, by having a schedule so heavily tilted toward intra-conference match-ups, it will kill off other rivalries. It must be said, however, that the best and most enduring rivalries are regional rivalries, which this new format enhances. For example, during the late 90s and early 2000s, one of the best rivalries was Colorado-Detroit, a hate-filled rivalry fueled by several hard-fought playoff series in consecutive years. Now, that rivalry has faded as the players from those years have moved on. In the last few years, Chicago-Vancouver has been a great and bloody rivalry, spurred by the exact same causes. But it too, will soon disappear and is indeed already fading. The truly enduring rivalries are those that are built by teams playing each other multiple games every regular season, sometimes evenly-matched, sometimes with the possibility for a legitimately surprising upset, but always with animosity borne out of the two teams being so close that the teams and their fans can really rub each other the wrong way. The best rivalries in the NHL are Montreal-Toronto, Boston-Montreal, Philadelphia-Pittsburgh, and some would add the “Battle of Alberta” between Calgary and Edmonton. These are all regional rivalries and all will be preserved in the new format. This entry was posted in Uncategorized and tagged NHL, politics, Russia. Bookmark the permalink. It’s about time. I need to live vicariously through people who are having more exotic adventures than I am! By the way, I totally agree with your analysis on the Russian protests. I hope all’s well! Have a very Merry Christmas!